The capital of Paraná, Curitiba is a large city with an undeniably high quality of life, being recently featured in Reader's Digest magazine as the 'best place to live' in the whole of Brazil. Curitiba is a wealthy and sizable southerly city with good transport connections to the entire state. In fact, local public transport is so organised that considering its size, the city is extremely easy to find your way around. Although it would be fair to say that Curitiba could never be accurately described as being a beautiful city, it certainly does have appeal and the plentiful pedestrianised shopping streets are perfect for an afternoon's stroll. A noticeable youthful vibe is provided by the presence of the renowned Universidade Federal do Paraná (Federal University of Paraná), while the Museu Oscar Niemeyer (Oscar Niemeyer Museum) is simply spectacular and amongst Latin America's very best modern art galleries, injecting a certain energy into the city's tourism offerings. One of the most reliable sources of tourist information in Curitiba is to be found at the bus station (rodoviaria), on the easterly side of the city, close to the train station and just off the Avenida Presidente Afonso Camargo. On the western side of the city centre, a further tourist information outlet stands on the Rua 24 Horas, where it is just a block away from the Praca General Osório and the Praca Rui Barbosa. Regarded by many as being one of the most developed cities in Latin America, Curitiba comes with a healthy proportion of attractions to occupy tourists. Green space is certainly in good supply all around the city, and the choice of parks and gardens is almost overwhelming, ranging from landscaped parklands and woodland trails, to public plazas. The Praca do Japao (Japan Square) is one of Curitiba's most unusual offerings and is a feast of all things oriental, being surrounded by mature cherry trees and featuring its very own tea house, which contrasts greatly with the backdrop of modern high-rise buildings. The Jardim Botanico (Botanic Gardens) are certainly a must-see attraction and it is quite likely that you will have seen photos of its stylish glasshouse centrepiece on holiday brochures advertising the city. Families will always enjoy spending time at the Parque Regional do Iguacu and exploring its zoological attractions. If you crave a little culture during the evening, then one of the frequent concerts staged at the Centro Cultural Teatro Guaira (Guaira Theatre Cultural Centre) may suit. More information about Curitiba Tourist Attractions. The city of Curitiba has been shaped by its buildings and landmarks over the years, and although many are relatively modern, there are certainly more than a few historic gems to search out, such as the majestic Catedral Basilica Menor de Nossa Senhora da Luz (Basilica Cathedral Minor of Our Lady of Light), which presides over the Praca Tiradentes. Within the Parque das Pedreiras, the Opera de Arame (Wire Opera House) is rather more contemporary in its appearance and is made from little more than a series of metal pipes. For the very best views of the city, head to the observation deck of the Torre Panoramica (Panoramic Tower), which is easy to reach using local tourist line buses (Linho Turismo). More information about Curitiba Landmarks and Monuments. There is an exceptional selection of museums within Curitiba, offering information on the history of Paraná and the city's steady growth since it was founded in 1693. Particular cultural highlights include the Indian relics at the Museu Paranaense (Paranaense Museum), the dioramas at the Museu de História Natural (Natural History Museum) and the large number of vintage vehicles at the Museu do Automóvel (Automobile Museum). When it comes to art galleries, then the Museu de Arte Contemporanea do Paraná - MAC / PR (Museum of Contemporary Art of Paraná) and the Museu Metropolitano de Arte (Metropolitan Museum of Art) are safe bets, although it is the quirky architecture at the eye-shaped Museu Oscar Niemeyer (Oscar Niemeyer Museum) gallery that does rather steal the show, both for its unique appearance and quality exhibits. More information about Curitiba Museums and Curitiba Art Galleries. Many attractions lie close by Curitiba and tourists often factor in time for a day trip or longer excursion. The nearby municipality of Campos Gerais is home to the 'Stone City' of Vila Velha, where a group of unusual sandstone pillars reside, with these photogenic formations being created by the natural process of erosion. At little more than an hour's drive away from Curitiba, the coastal town of Morretes stands on the banks of the meandering Rio Nhundiaquara (Nhundiaquara River) and is favoured by rock climbers and outdoor enthusiasts, who flock to its Parque Estadual Marumbi. Especially close is Antonino, a small colonial port town fronting the Baia de Paranagua (Paranagua Bay) and boasting a number of tree-lined waterfront promenades. If possible, do leave a day to visit the simply awesome beach resort of Ilha do Mel, which is located to the south and offers not only beaches, but also a historic fortress, a traditional lighthouse and some 'Enchanted Caves'. For a taster of Brazilian wildlife, a chunk of the Atlantic Rainforest is situated to the north-east, within the Parque Nacional do Superagui (National Park of Superagui). 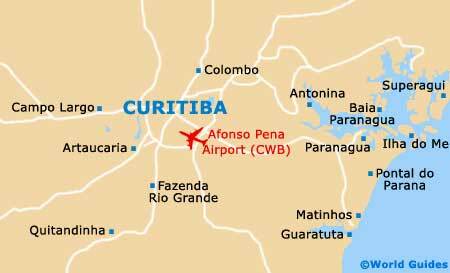 More information about Curitiba Attractions Nearby.